Little River Casino Resort, near the Lake Michigan shore in Manistee, offers a full-blown fun time with a little something for everyone. First of all, the hotel’s luxurious rooms await, as does a private fitness center, a spa and salon, three pools, and a sauna and hot tub. When you get all settled in, it’s time to hit the casino and enjoy more than 1,400 slots, great table games like Texas Hold ‘em, blackjack and craps, as well as high-limit play and a non-smoking gaming area. Your group will also love all the dining options available, including the incredible Big Lake Buffet with everything you can imagine, the River Rock Sports Bar & Grill to catch the game and have some wings, the Rapids Bistro for pizza or a snack, and the Horseshoe Bar for your favorite craft beer or specialty cocktail. After dinner, make sure to check out the entertainment; Little River Casino Resort is a well-known venue for some of the best concerts in the state. Promotions vary from month to month so check them out when you make your group’s reservation. Soaring Eagle Casino & Resort in Mt. Pleasant is a great place to relax and have fun. For the gamblers, there are table games like blackjack and craps, thousands of slot machines, a 24-hour poker room, and everybody’s favorite: bingo! If you prefer something a little more refreshing, the Soaring Eagle Waterpark offers some excellent floating, sliding and soaking opportunities, as well as a climbing wall, an oversized adult hot tub and luxurious cabanas. Like every great resort, Soaring Eagle offers a spa experience to help shake off the winter doldrums with massages and facials that will give you a new outlook. Entertainment is another specialty, with top-rated concerts running throughout the year. If dinner is on your mind, Soaring Eagle excels at pleasing the palate. Whether you want a juicy steak at Siniikaung Steak & Chop House, Italian at Isabella’s, or you prefer a little of everything at the amazing Aurora Buffet, the choices are outstanding. And for those quick bites or a drink with friends, try the Water Lily Lounge, Legend’s Diner, or The Sub Shop. 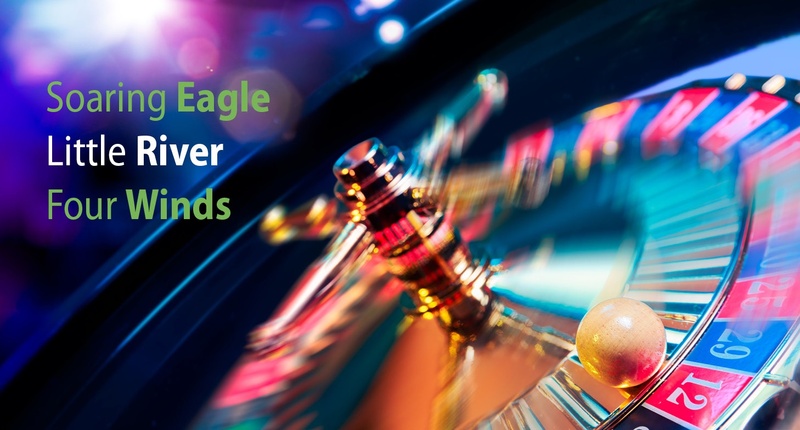 Find out about specials and book today at Soaring Eagle. Four Winds Casinos has locations in the southwest in Dowagiac, Hartford, South Bend, Indiana, and the largest at New Buffalo. This massive resort has it all, from breathtaking architecture to 130,000 square feet of gaming floor. Imagine 2,600 slot machines as well as table games like blackjack and roulette, including a high-limits area, non-smoking area and keno area. When thoughts turn to dining, it’s going to be hard to choose from the fantastic restaurants like Copper Steakhouse with steak, lobster and 450 wines available; The Buffet, winner of TripAdvisor’s Certificate of Excellence in 2017; Timbers Fast Food & Deli; or the only Hard Rock Café in the area. While you’re planning, don’t forget to check the entertainment calendar at the various venues, including Silver Creek Events Center, C Bar and the Hard Rock Café. Of course, the Four Winds Hotel New Buffalo will more than meet your expectations with 415 luxury rooms, a fitness center, a pool bar, and smoking and non-smoking rooms. There’s so much to do at Four Winds you’ll enjoy every minute of your stay. Choosing a casino resort for your winter group trip can be hard, but choosing a charter company is easy because Indian Trails is among the best and we know Michigan, not to mention Michigan casinos, better than most. Find out about our beautiful new buses and all the amenities we offer and book your charter with Indian Trails today!